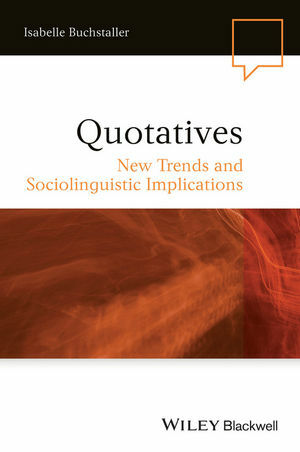 Quotatives considers the phenomenon “quotation” from a wealth of perspectives. It consolidates findings from different strands of research, combining formal and functional approaches for the definition of reported discourse and situating the phenomenon in a broader typological and sociolinguistic perspective. Isabelle Buchstaller is professor for English at Leipzig University. Her research focuses on (morpho-) syntactic and discourse phenomena, including quotation, intensification and Northern English features, such as the Northern subject rule. Among her publications is Quotatives: Cross-linguistic and Cross-disciplinary Perspectives (2012, with Ingrid van Alphen), which investigates quotation cross-linguistically from a wealth of disciplines.